The Teddy Bear Hospital is a unique educational program established and actively run by volunteer medical, nursing, physiotherapy, optometry and dentistry students of the University of Melbourne. The core aim of the Teddy Bear Hospital is to familiarise children to health care environments and medical treatments in a fun and interactive way! By creating a positive interaction between the child and the "Teddy Doctor", the Teddy Bear Hospital aims to overcome fears and anxieties children may hold concerning the hospital environment and its health professionals. At the same time, The Teddy Bear Hospital also endeavours to educate children and promote healthy lifetstyle behaviours including healthy eating, exercise and good sleep. All these objectives are achieved through mock medical consultation scenarios in which children (acting as doting parents!) bring their beloved teddy bear or soft toy to the Teddy Bear Hospital for a check-up! 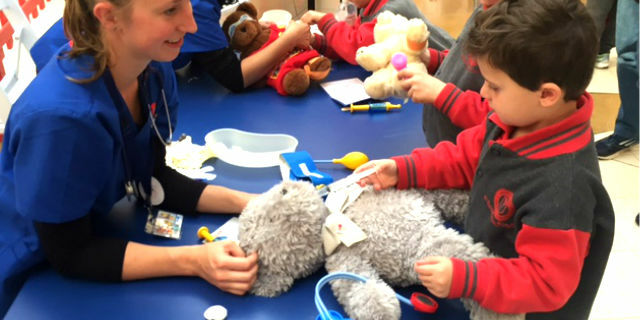 Throughout the year, student volunteers practice their "Teddy Bear Medicine" in Teddy Bear Hospitals organised within kindergartens, primary schools, as well as local commmunity centres and events across the state, to encourage and educate young children. But it is not only the kids who benefit from this program! The Teddy Bear Hospital also plays a pivotal role for future young doctors, nurses and allied health professionals in developing the unique interactive skills required to engage successfully with children. The program has been considered such a valuable learning tool for students that it is now a permanent fixture of the Doctor of Medicine (MD) curriculum at the University of Melbourne.